There are a lot of incredible sights in the Smoky Mountains, but some of them require hiking many miles. Luckily, there are some excellent short hikes in the national park that offer beautiful mountain views, waterfalls, and historic structures. To start planning a great day in the Smokies, check out the 10 best short hikes in the Great Smoky Mountains National Park! We've made a list of the best hiking trails in the national park that are less than 5 miles in length, so you can enjoy the best sights in the Smokies without having to spend a long day hiking in the mountains. Located a short hike from the Clingman's Dome area of the Smokies, Andrews Bald is an excellent short trail with beautiful mountain views. 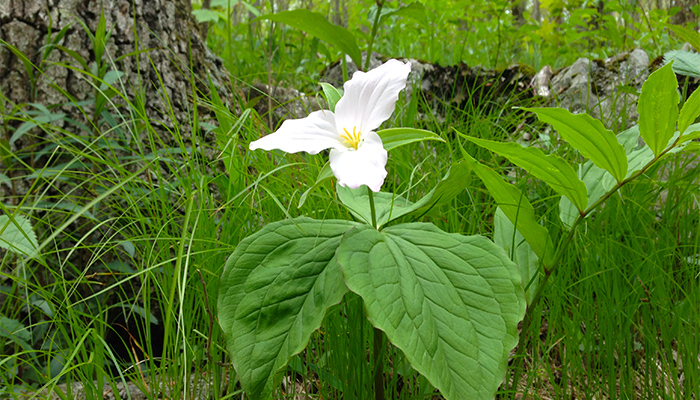 In the Smokies, a blad is a unique, high elevation field that's home to a variety of flowering plants. Additionally, these fields offer unobstructed mountain views that go on for miles and miles. To reach Andrews Bald, you'll only have to hike along the Forney Ridge Trail for 1.75 miles as it descends to the bald. Along the way, you'll pass through stunning sections of high-elevation spruce-fir forests that thrive in this part of the Smokies. Though sections of this trail are steep and rocky, this hike's short distance makes it accessible to many hikers. Please note, the Clingman's Dome Road that is used to access the Clingman's Dome area of the park is closed from November to March due to snow and ice. 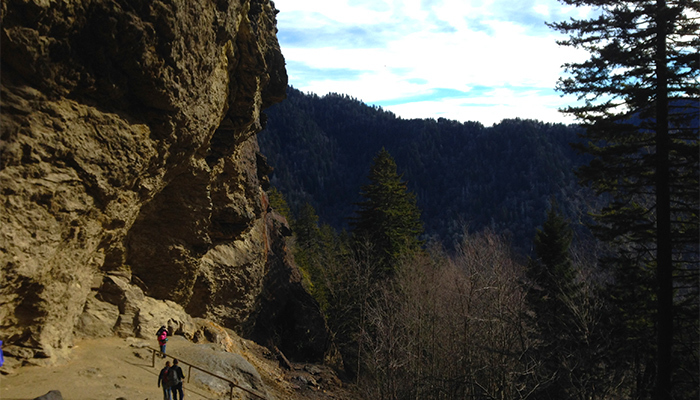 You'll find this iconic Smoky Mountain hike a short drive from Downtown Gatlinburg, TN just off of the Newfound Gap Road. Though wildfires in 2016 closed the summit of the Chimney Tops, hikers can still enjoy a beautiful overlook that's near the end of the trail. The Chimney Tops Trail features many highlights including high elevation mountain streams, beautiful Hemlock Forests, and mountain views. Additionally, with a round-trip distance of 3.3 miles, this hike is short and sweet. Visitors should know that this trail is steep and quite strenuous. Additionally, due to its lovely scenery and proximity to Gatlinburg, the Chimney Tops Trail is popular and it can become crowded at times. This hiking trail does not appear on most park maps and it is arguably one of the best-kept secrets in the Great Smoky Mountains National Park. 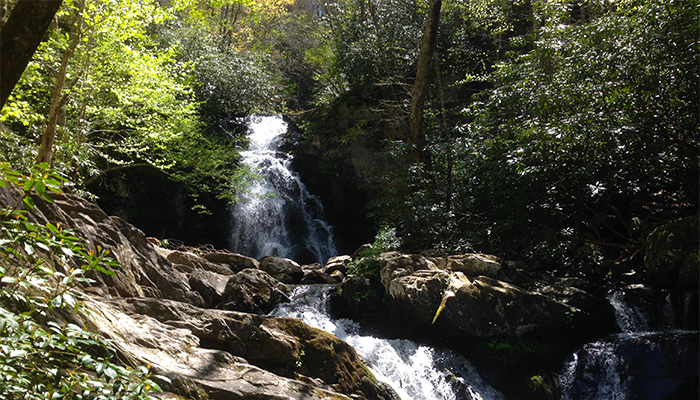 With a 2 mile round-trip, the Spruce Flats Falls waterfall hike is one of the best short hikes in the Smokies. 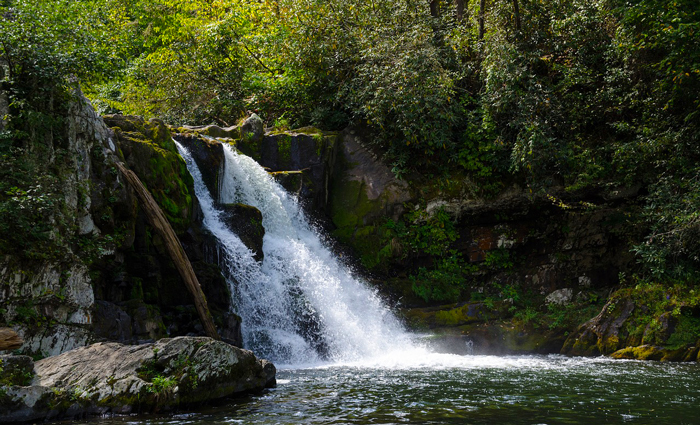 You'll find the trailhead for Spruce Flats Falls behind the Great Smoky Mountains Institute Visitors Center in the Tremont region of the national park. To start this hike, begin hiking the Lumber Ridge Trail. After a short distance, you'll see an unmarked trail branch off to the right; this is the way to Spruce Flats Falls. This short trail is relatively easy though it does feature a few steep sections. During the winter months, you'll enjoy impressive views of the towering Thunderhead Mountain. The highlight of the trip is the lovely, multi-tiered waterfall that's beautiful in all seasons. 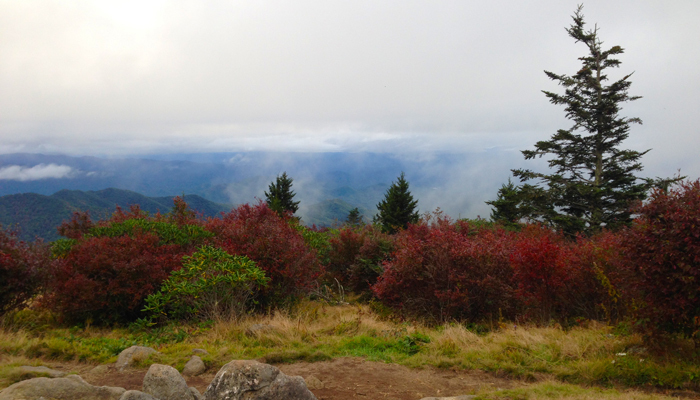 At a round trip distance of 1 mile, the Clingman's Dome Trail is definitely one of the shortest hikes in the Smokies. This paved trail begins in the Clingman's Dome Parking area and goes to the Clingman's Dome Observation Tower. This paved hiking trail takes visitors to the highest point in the Great Smoky Mountains and it features beautiful mountain scenery the whole way. Though this trail is short and paved, it is quite steep, so be prepared to feel a burning sensation in your legs on this hike. Luckily, this trail is well-worth the effort and you'll get to enjoy the view from the 6,643 ft observation tower! 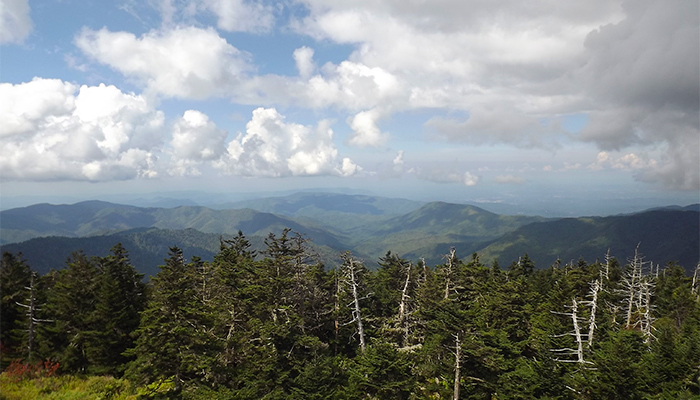 Lastly, like Andrews Bald, Clingman's Dome can be reached by taking the Clingman's Dome Road. This route is closed during the winter months. The peaceful Greenbrier area of the national park doesn't receive as much traffic as other areas of the Smoky Mountains, but it's no less beautiful. Porter's Creek Trail is an excellent short trail in the Greenbrier area that features historic buildings and a waterfall. Early on in the hike, you'll reach the Elbert Cantrell Farmstead and the Ownby Cemetery. Additionally, a short side trail will take hikers to the John Messer cantilevered barn. The trail passes through lovely sections of old growth forest on its way to the highlight of the trail, the 60-foot Fern Branch Falls. In spring, this hiking trail is known for being one of the best destinations for viewing wildflowers in the national park. 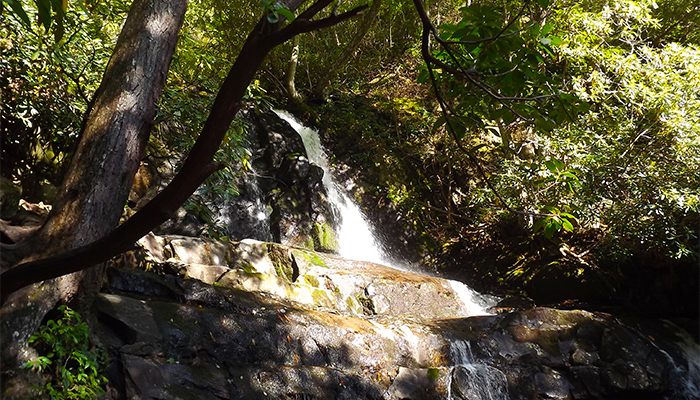 With a beautiful multi-tiered waterfall and stunning groves of mountain laurel, this short hiking trail near Gatlinburg is known to draw big crowds. After all, this short hiking trail is a classic hike delights visitors year after year. Because this trail receives significant foot-traffic, the national park paved this trail to prevent erosion. 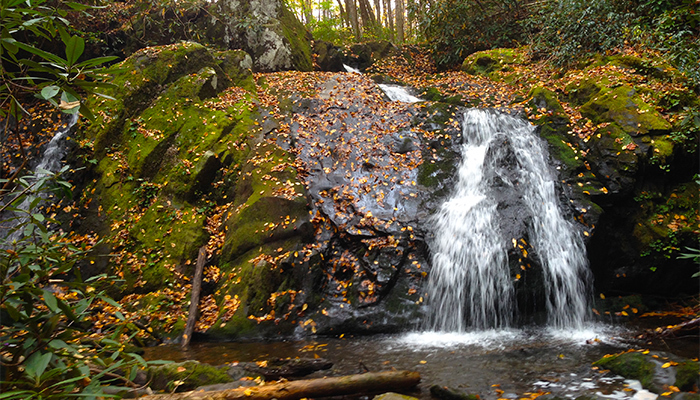 You'll find the trailhead for Laurel Falls on the road between Sugarlands Visitor Center and Elkmont at Fighting Creek Gap. Because this trail is popular, we recommend beginning your hike early in the day to dodge the crowds. The main highlight of the trail, the 80 ft Laurel Falls, is a perfect place for a group photo. Visitors should also know that though this trail is crowded, it is known for having frequent bear activity, so if you see one of these animals give them plenty of space. This short hiking trail is a great way to see two waterfalls on one trail! The trailhead for the Meigs Creek Trail begins at the Sinks parking area, which is right next to the impressive Sinks waterfall. This impressive waterfall on the Little River was created when a large amount of dynamite was exploded to free up a logjam. Because this waterfall is located just off of the roadside, it's a popular destination for swimmers and kayakers. Though the observation point for the Sinks can be crowded, far fewer visitors make their way onto the Meigs Creek hiking trail. This pleasant hiking trail passes through some lovely scenery and after 1.2 miles of hiking, you'll reach the impressive 18 ft. fall Meigs Creek Cascades. Please note that this trail contains numerous stream crossings, so take care when hiking this trail after rainy weather. The Alum Cave Trail is the shortest route to the summit of Mt. LeConte, but at 5 miles in length, this trail requires a full day hike to enjoy the mountaintop. However, if you only have time for a short hike, we recommend hiking to Alum Cave Bluffs that can be found right at the halfway point of this trail. The Alum Cave Bluffs are a section of 80 ft tall, overhanging cliffs. 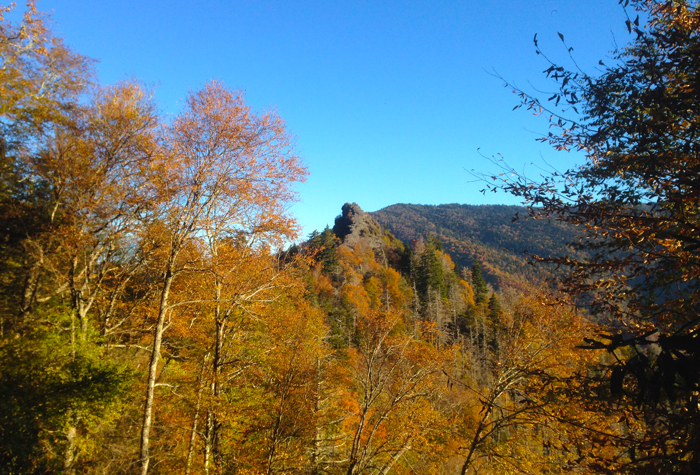 This unusual geologic formation in the park is a must-see in the Smokies. Additionally, on your way, you'll enjoy other excellent sights like Arch Rock and the panoramic mountain views of Inspiration Point. Though the Alum Cave Trail is one of the more popular hikes in the Smokies, it is well worth experiencing because it offers so many unique highlights. At only 4 miles in length, the hike to the Walker Sisters Cabin from the Metcalf Bottoms picnic area is one of the easiest, shortest hikes in the Smokies. This peaceful hiking trail features lovely sections of forest and several historic buildings. At the half-way point, hikers will reach the historic Little Greenbrier Schoolhouse and Cemetery. By hiking about a mile further, you'll reach the historic Walker Sisters Cabin, a remote old farmstead that used to be inhabited by 5 unmarried sisters. 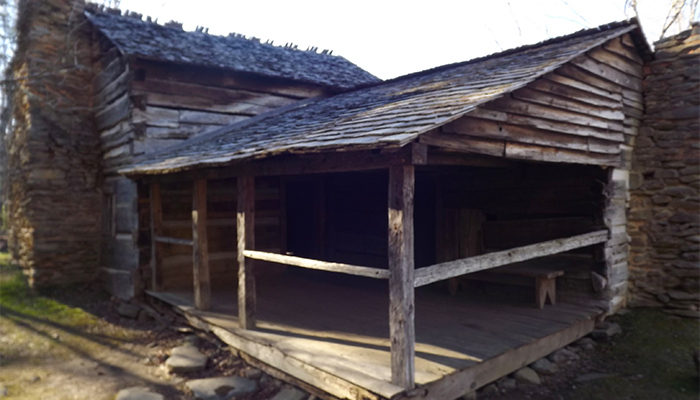 The Walker Sisters Place features a well-preserved cabin, an old spring house, and a corn crib, so you can really get an idea of what life was like for settlers in the mountains. The Walker Sisters were permitted to stay on their homestead following the formation of the national park, so they were among the last, permanent residents of the Smokies. The Abrams Falls trail located just off of the popular Cades Cove Loop road is a true classic in the Smoky Mountains. Better yet, this moderately difficult trail is only a 5.2-mile round trip, so it doesn't take very long to hike. The Abrams Falls trail passes over a series of ridges before descending to Abrams Creek. At the trail's terminus, you'll find the impressive 20 ft waterfall that's known for having one of the highest volume flows in the national park. Visitors should know that swimming at this waterfall is discouraged due to powerful currents that have drowned swimmers. Additionally, visitors should exercise caution on slick rocks near the falls. Please note that this hike can be very crowded since it is one of the most popular hiking trails in one of the most popular areas of the Great Smoky Mountains National Park. For enjoying this trail without the crowds, we recommend hiking this trail in the winter or spring. Though the Smoky Mountains are filled with over 800 miles of hiking trails, sometimes you only have enough time to hike a few miles in the great outdoors. These short hikes are a great option for beginner hikers and they offer great rewards for minimal effort! We'd love to know, what's your favorite short hike in the Smokies? Feel free to share your thoughts in our comments section!